This Golden triangle tour package offers you tour of Holy city of Ajmer along with tour of Delhi, Agra and Jaipur. Where you can explore beauty of 04 historically important cities. 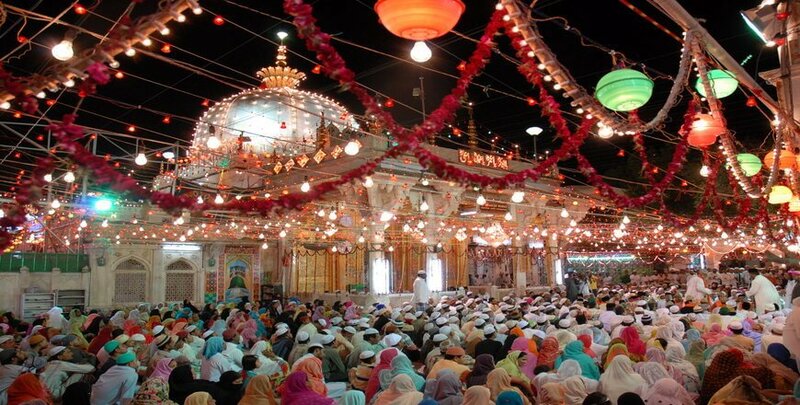 Holy city Ajmer is a city in the Indian state of Rajasthan. In south of the city artificial Ana Sagar Lake is Ajmer Sharif Dargah, the domed shrine of the Great Muslim Sufi saint Garib Nawaz. Almost, a 16th-century palace built by the Mughal emperor Akbar now it houses the Ajmer Government Museum, which display armor and stone sculptures. Booked Golden Triangle with Ajmer with Ghum India Ghum at a very unbeatable price. After breakfast drive to Ajmer .​ On arrival visit the famous Dargah Shariff, ​Shah Jahan's mosque, Taragarh fort at Ajmer. Ajmer is a city in the northern Indian state of Rajasthan. South of the city's artificial Ana Sagar Lake is Ajmer Sharif Dargah, the domed shrine of the Muslim Sufi saint Garib Nawaz. Nearby, a 16th-century palace built by the Mughal emperor Akbar now houses the Ajmer Government Museum, displaying armor and stone sculptures. A museum at the Indo-Saracenic–style Mayo College exhibits art and taxidermied birds. After completing the sightseeing tour of Ajmer .Then drive back to your hotel .​ Night stay in Jaipur. This morning after breakfast visit the Amber fort, built in 16thcentury, enjoy an elephant ride at Amber. Drive past the HawaMahal-a Palace of winds. In the afternoon you will visit the citypalace and museum, walk to adjacent JantarMantar anastronomical observatory. Rest of the evening is at leisure. Stayovernight at hotel in Jaipur. Today after breakfast you will be transferred back to Delhi or Jaipur airport/railway station for your onward journey. Return home with sweet memories of this tour along with life long memory. 1N stay in Delhi. 1N in Agra and 3N in Jaipur..